With its advanced techniques and frequent updates, almost all Blu-ray and DVD movies can be easily converted to suit your needs for entertainment. Rip or backup Blu-ray/DVD disc to H.265/HEVC codec for better storage, playback and online streaming. Create 3D videos out of source 2D Blu-rays/DVDs to enable users watch movies in 3D on any 3D devices with ease. Rip 3D Blu-ray to movies in 3D MKV, 3D MP4, 3D AVI, 3D WMV, etc. for various 3D TV and players. 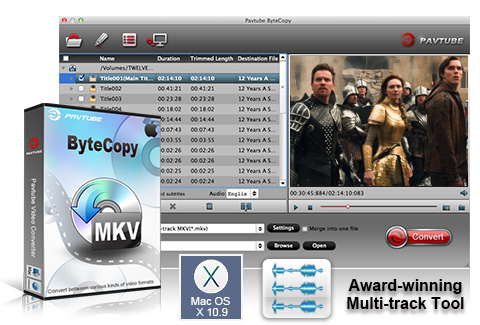 Compress a Blu-ray or DVD to MKV, MP4, MOV, Apple ProRes MOV with multiple languages and subtitles for free switch during playback. Clone Blu-ray and DVD from physical disc to computer with original structure in 1:1 without any quality loss including all audio streams, subtitle tracks and chapter info. Apply to Android devices which are FAT 32 formatted and easily split movie into several smaller video clips according to quantity, duration, and output file size.